I discovered something that made me shocked, amazed, impressed and more! I was at work creating and testing scorm worksheets. Scorm worksheets are courseware which contains things like lessons and quizzes. It needed a software called Reload software which I found easily in the work computer. Farid, the previous trainer had left plenty of software I could play with in the computer. I started to go through the numerous applications that he installed previously. I was like the quintessential story of the kid in the candy store. I saw a program called Feedreader and thought to myself Hey .. What does this do? So I clicked on it and at first glance I thought, ho-hum. Its just a plain newsreader. So what? But upon closer inspection, I saw that it supported RSS. That means that it was able to support blogs too. I wanted to experiment and give it a try and typed in the Rinaz Bloggariffic site feed url. What I saw, I really liked. The blog was seen in a very clean interface without any other distractions. Of course, people can’t post comments or trackbacks though. Feedreader is just its namesake. You can only read it. However I liked the fact that I would be able to read multiple blogs at the same time. Traditionally, I’d usually go to my links one by one to see if they are updated so I can read them. But it didn’t stop there. Feedreader was part of feedburner. I heard about feedburner from alot of different blogs and I decided to sign up an account with them to see the different things that I could do with them. It’s pretty cool as only uses a gif picture and a live feed via a href and a img src. I really liked it. It didn’t need figuring out what code to insert as its a simple copy and paste. Amazing. The beauty of using gif images like this is that, not only can it be inserted in webpages, it can also be easily used in emails, forum signatures which can be fussy about the codes being used. But as exciting as Feedreader and Feedburner are, what got me the MOST enthusiastic is the discovery of a certain archiving website. I honestly thought that my original blog at blog-city was gone as it seems that any blogs which isn’t updated in 60 days will be deleted. That sounds fair, to save on bandwidth issues. But I think it would be nice if they would at least notify in advance so I could be reminded to log in. Like the now defunct tripodasia, when they announced that they will be stopping their hosting services. I would have appreciated if they let people have a notice and at least a week’s grace to save their webpage. Thus I was quite ticked off at that gesture. It was extremely rude. Anyway, coming back to my older blog, I was a little upset, because I remember pouring out a lot of heartfelt articles in it. And then I found it gone. I would have liked to see it and reflect about the previous things that I thought about, experienced and compare it to my present life. So I thought it was gone. Never to be seen again. Just coincidentally I saw this particular website while Googling. It was supposed to be a trackback and archive of the different website cached throughout the years. Sounds interesting. On a whim I typed out one of my old webpage addresses, not expecting anything. Just to see what it does. It was there. Archived. My webpage. I never imaged that I’d ever see my old webpage ever again. I saw my older articles and read them and reminisced. I was just purely amazed. I’ll give you an example. 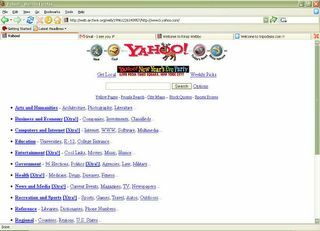 Take a look at yahoo throughout the years and see what I mean. 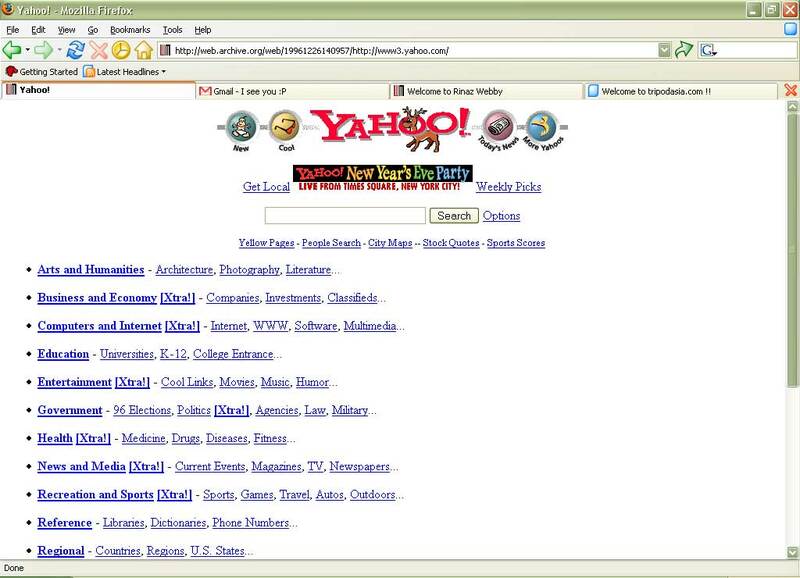 Do you recognize Yahoo from 1996? I could even remember the yahoo interface then during the good old days of the 36.6 kbps modem. Now I’m track-backing and typing down the different web addresses for some of my older websites that I thought was lost. Unfortunately it might not work for certain sites. My old geocities webpage didn’t work. My crosswinds webpage couldn’t be found either. I’m using feedburner to feed my blog in friendster…to tell u the truth, I hv no idea wat de hell feeds is all about. I just fed it and it worked. good enuff for me. As long as ppl in my friendster can access my blog…actually i’m not very happy not knowing abt this feed stuff…here I go again…being neurotic! If you go to http://www.google.com/ig you can customize it to have what ever RSS feeds you like there, and the best part is, it will follow you from computer to computer. my.yhaoo.com does the same thing, but personally I prefer Google’s less cluttered interface. And yes Rinaz, I keep your feed on my home page so I can pretend I visit all the time to see new content, when really what I am doing is coming here because I saw a new headline. Ooo did I just say that out loud? hahaha…now dats a good thot..thx kryss for the tip. Rinaz..we shud go out and snap sum pics together with Jules..now dat she has a blog…? Crunchy green apple : Yes, I was totally nutso about creating websites. I knew I left alot of trails online. I had a singnet webpage, a cyberway homepage, one from focus asia, about 3 from tripod, 2 from geocities, two from brinkster, one from homestead, one from tripodasia, one from fortunecity, and one from xoom. I’m sure you’ve an obsession. It might not be webpages. Something else maybe? And yes, I’d like that snap some pictures with you guys, of course! 🙂 Will you guys be interested in the nature photoshoot organized by photoi? It’s not the same for all computers, but here is a generic version of what to look for to make your computer boot from the CD. I find it odd since I can boot from my win xp installer without any changes to the compy and yet having problems with the iso disk.